Jai Ram Thakur, Himachal Bhartiya Janta party leader was a former Cabinet Minister in the Government of Himachal Pradesh. He was minister of rural development and panchayati raj. He was elected to Himachal Pradesh Assembly from Mandi. 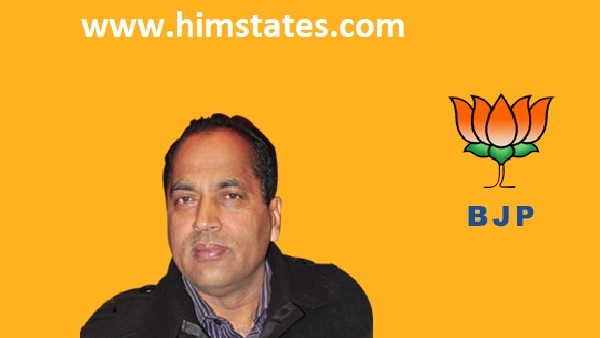 He has won his first election in the year of 1998 and after that he served State BJP and state Jai ram Thakur started his political career with RSS during his college days. He is one of the biggest leader of Himachal BJP. In 2017 elections after defeat of several senior leaders like Prem Kumar Dhumal, Satpal Satti, Gulab singh Thakur and Ravinder Ravi etc. Jai ram Thakur emerges as frontrunners for chief minister of Himachal pradesh. Address :Village Tandi, Post Office and Tehsil Thunag District Mandi, Himachal Pradesh. Jai Ram Thakur born in Tandi village of Mandi District in Himachal pradesh. He graduated from government college Mandi. Jai Ram Thakur started his political from RSS and became Joint secretary of state Akhil Bhartiya Vidhyarthi parishad (ABVP). Later in year 1998 he won his first election. He won from Chachiot constituency in 1998 for first time. He served state as cabinet minister and party at different positions. Jai Ram Thakur is son of Shri Jethu Ram Thakur, He married to Mrs. Sadhna thakur. His wife is Doctor by profession. She is well known doctor of Mandi district and also Social worker. Jai Ram Thakur started his political life at very young age. He joined RSS and student wing of BJP, ABVP. He became Joint Secretary State ABVP in 1986. He also worked for party as Organizing Secretary in ABVP of Jammu and Kashmir in year 1989-93. Jai Ram Thakur also served party as State Secretary of Bharatiya Janata Party Yuva Morcha. Jai Ram Thakur served State BJP as Vice President and President State Bharatiya Janta Party. He was elected to the State Legislative Assembly in 1998 from Chachiot and re-elected in 2003 and 2007. In 2012 and 2017 Jai Ram Thakur elected from Seraj Assembly Constituency. He also fought against Pratibha singh, wife of Virbhadra singh in by-poll election but he lost from Mandi Loksabha seat. - Jai Ram Thakur Started his Political career when he was in college and joined ABVP. - Jai Ram Thakur served ABVP as Joint secretary of state ABVP, Organizing Secretary of Jammu and Kashmir ABVP. - Jai Ram Thakur served Bhartiya Janta Yuva Morcha secretary and state president of BJYM. - He became vice president of state Bhartiya Janta Party in year 2005, and President of Himachal Pradesh BJP in year 2006 to 2009. - Jai Ram Thakur became Chairman of General Development Committee and Education Committee. - He served as Vice-Chairman of State Civil Supplies Corporation Limited. - He also remained Chairman of Rural Planning Committee and Member of various other House Committees before being inducted into Council of Minister as Panchayati Raj and Rural Development Minister on 09-07-2012. - Jai Ram Thakur reached 5th time in state assembly after winning continuosly five time. - In 2017 state assembly election Jai Ram won against Chet Ram of Congress party with a margin of votes around 9000. People of Himachal Pradesh and Mandi district are proud of Jai Ram Thakur. Himstate and People of Himachal pradesh want great serving from Jai Ram Thakur and wish him to acieve lots and lots of success.